Title: NYSW 2302's conductor talking to one of many railfans at the maple fest. Description: First shot on the site of the newly acquired 2302, well renumbered 2302. 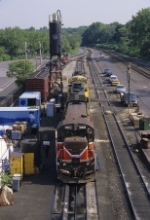 Description: Four locomotives in Ridgefield Park, NJ. Description: A look down at this GE U23B in for service. Description: RIP NYSW GP18 1802. Description: LR 2302 near NS 5101. Description: Lehigh railway name with NYSW numbers. Description: Lehigh railway name with NYSW numbers in Towanda, PA. Description: I photographed this loco in Towanda, PA in January, today as I make my rounds, it is at the Luzerne Susquehanna Garage in Pittston. ?? ?.